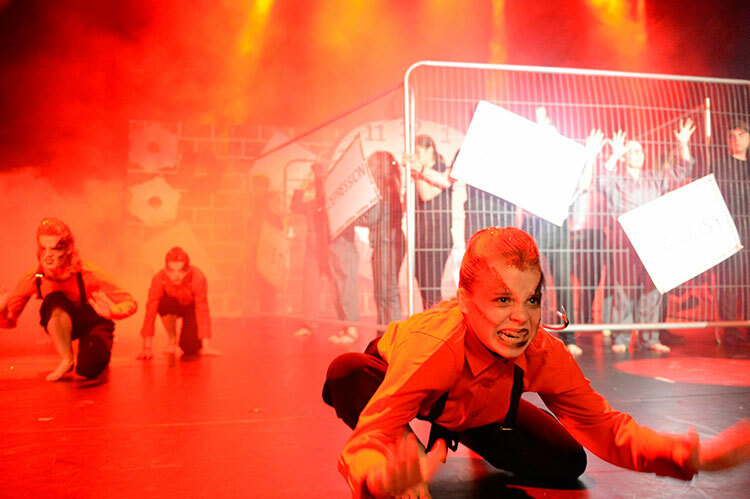 On Friday 29th June a group of 68 pupils represented the Academy in the Northern Final of Rock Challenge. I am proud to announce that they came 2nd place, which means that Winifred Holtby Academy are now an elite Premier Division team! This status is something that the pupils are very proud of, as this means that pupils from Winifred Holtby Academy are now amongst the best in the country! It was another fantastic day which began at 6.00am in the morning as pupils arrived in time to leave the Academy at 7.00am. Pupils arrived at Grimsby Auditorium very excited about the day ahead- chanting and cheering. After a successful morning rehearsal, followed by watching the other schools rehearse and seeing their teachers dance on stage, it was time to get ready for the evening performance. The pupils put on their costumes, had their hair and make-up done and sat focused ready to perform. They were then called to the stage. After waiting in the corridor with a mixture of nerves and excitement the time came to perform. Every pupil on stage was focused on the goal and performed amazingly with lots of energy throughout the full performance. The judges commented very positively on the performance and then it was time to wait for fate to take its toll- what will be, will be! After the Awards of Excellence were announced it came down to who had placed in the top 5! After the results the pupils were chanting, screaming, crying as they were so proud of what they had achieved- and rightly so! (Including tears from some members of staff, and not who you may think). A huge thank you must go to the staff who supported on the day, and the days leading up to the event: Miss Selby, Mrs Crees, Mrs Stark (including Michelle’s daughter Gemma who did wonders with hair and make-up), Mr Freeman, Mrs Hoy, and last but not least Mr Ostler for helping us to construct our most ambitious set to date (even if you did doubt my crazy ideas!). Final word must go to the pupils. I cannot begin to explain what an amazing group of young people they are- they are a shining example of some of the fantastic pupils we have at Winifred Holtby. Their conduct during the day was exemplary and to see how they have developed over the years was incredible; they were not overawed by the occasion or the fact that they were competing against schools with Sixth Form A-Level dancers, they had an inner belief and self-confidence that if they tried their hardest and gave it everything they had then they would be rewarded for their hard work- which they were! 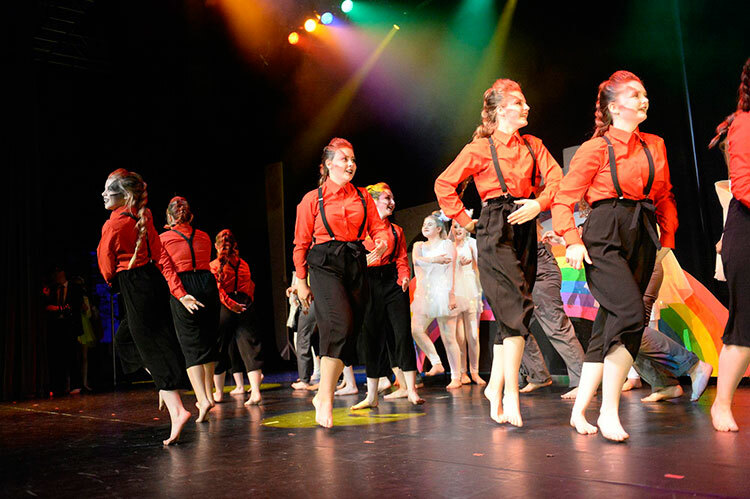 As you know, on Friday we competed in the Northern Final of Rock Challenge, against the very best schools in the North of England, Scotland and Northern Ireland this year. There were 11 schools competing and we came an amazing 3rd place; made even more amazing by the fact that we qualified for the competition as the highest scoring second-place wildcard from our heats! Overall 3rd place 3rd place in the Northern Final! This means that this year we were the highest ranked school from Hull in this year’s whole Rock Challenge Competition- Winifred Holtby Academy, the best in Hull! This year was even more special than any other year because this year it was completely pupil led! I wasn’t going to enter us this year yet the pupils signed a petition which included over 80 names for us to re-instate Rock Challenge, so we did; the Academy simply wouldn’t have achieved this result if it wasn’t for the pupils- they are just incredible and deserve all of the credit, so if you see them today please take time to congratulate them on an absolutely incredible effort which increases the reputation of the Academy for us all! Finally, thanks must also go to K. Senior (an ex-pupil who came back to choreograph the dance), Mrs Crees, Mr Freeman, Ms Stark, G. Osler (Ms Stark’s daughter who made our pupils look amazing with their hair and make-up) and Mrs Hoy. Without this small group of staff dedicating many unpaid hours of their time to the pupils, the pupils wouldn’t have been able to achieve their ambitions- thank you for all the support that you have given to the pupils to make Friday so special! One very proud Liaison Teacher! The Rock Challenge Northern Final is this Friday (30th June) held at Grimsby Auditorium. Doors open at 6.00pm and the show starts at 6.30pm. We will be competing against 9 other schools across the North of England/Scotland and Northern Ireland in a bid to be named ‘Rock Challenge Northern Final Winners 2017!’. Rock Challenge – what a fabulous day – pupils excited and ready to perform – set off for the Ice Arena 10.15am, lots of singing and chanting getting themselves into the spirit of the day –pupils and staff worked really hard all day ensuring that everything was in place for them to wow the audience with their performance and wow they did – scooping 2nd place overall and winning awards of excellence in all sixteen categories – we left the arena at 9.45pm a long, but enjoyable day.